Meeting Room in Wagle Estate Thane is available for Hourly,Half day and Daily Basis. Meeting Room in Wagle Estate is located at Thane. It is a 6 seater Meeting Room. 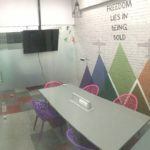 It is purely a co-working space and one can easily find this space with like-minded people, yet unique thoughts; Intense passion, yet a different goal moreover one can grab it on Monthly basis. You can rent a meeting room by the hour as per your requirement.